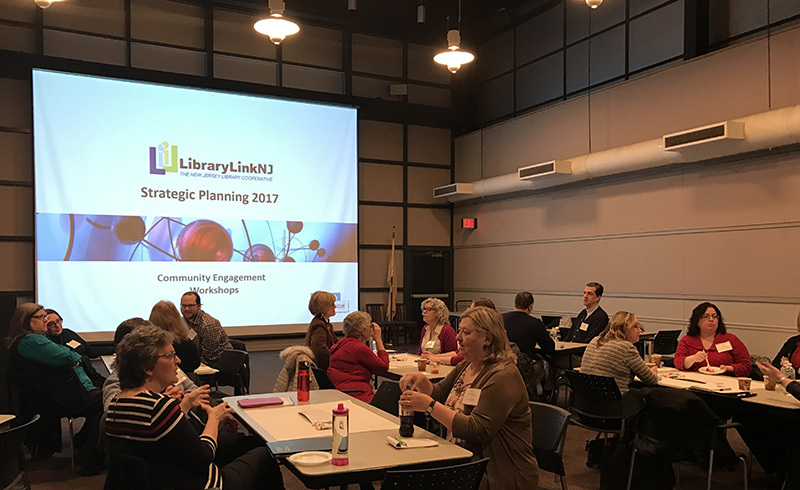 LibraryLinkNJ is looking towards the future and embarking on a new strategic planning process in 2017. The resulting Strategic Plan will cover FY18 - FY20 (July 1, 2018 - June 1, 2021). Thank you everyone who participated in the survey. Please follow this link to view the FY18-20 Strategic Planning Survey Results Executive Summary. We invited you to contribute your knowledge and expertise at one of our Stakeholder Engagement Workshops. Six free 3-hour morning or afternoon workshops were open to all members from every type of library, and one workshop was scheduled for school librarians. Led by the consulting firm of Maverick and Boutique, the focus will be on current and future trends affecting libraries and their users. We’ll discuss possible solutions, and your input will contribute to the creation of our next strategic plan. These workshops are not just for library administrators. We are specifically inviting staff representing all library roles and generational identities to attend. This is a great development activity for both newer and seasoned staff members and an important opportunity to shape the future of LibraryLinkNJ and NJ libraries. Shape the future of LibraryLinkNJ and NJ libraries. Engage with a top strategic change consultant, Abby Straus of Maverick & Boutique. Track future societal and library trends affecting your library or library organization. If you would like to participate, please register to attend. The workshops are free, but we do need a headcount for our preparations. Light morning or afternoon refreshments will be served. We appreciate your participation and look forward to working together to plan the future of libraries in New Jersey. If you have any questions, please call the LibraryLinkNJ office - 732-752-7720.